Color: The jumpsuit is a dijon mustard color with heavy weathering. All visible stitching is two shades lighter than the jumpsuit fabric. Hood: There is a hood attached to the collar of the jumpsuit and has a center panel. Seams: There are vertical front seams on the suit starting at the bottom middle of the front yoke on each side and extending down to the bottom of the pants. The sleeves have seams on the front and back that line up with the front and back yoke seams. Zipper: The suit has a front zipper that goes from 3”-4” below the yoke to the crotch of the pants and is hidden by a placket. There is a closure (snap, hook, etc) at the bottom of the yoke. Pants: The pants are bloused over the top of the boots, hiding the top of the boots. Waistband: There is a waistband that is covered by the belt. Pockets: There are 2 pockets: one chest pocket on the left side under the rank badge and one on the left leg around mid thigh. Pockets should be proportional to the costumer. Both pockets stand out on the jumpsuit. The chest pocket is square and roughly the same size as the patch that is on the opposite side of the jumpsuit. The pocket has a flap with a grey webbing tab and there is top stitching around the edges of the flap. There are 5 vertical lines of stitching on the center on the pocket. The thigh pocket is a rectangle, it is the same width as the chest pocket. There is a window in the thigh pocket for the com pad. The flap has a grey webbing tab and there are 14 lines of top stitching, 7 lines on the left side, 6 lines on the right side and one line in the middle of the flap. *Top stitching on the pockets is recommended but not required. 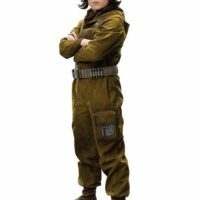 Aurebesh: There is a square patch on the right side of the jumpsuit that reads “GLD Landing Officer” in Aurebesh lettering. “GLD” is in 1” type on one line, with “Landing Officer” on the second line in ½” type. Rank Badge: There is a rank badge on the jumpsuit above the chest pocket sewn into a small fabric pocket. The left side of the pocket is not sewn to the jumpsuit which allows the badge to be removed. The badge is silver with a round button on the right hand side that is mustard yellow. There are 3 raised rectangular pieces in the upper left hand corner, 2 small silver buttons under the right 2 rectangles, and a raised cylinder in the right hand side. Hose Connectors: There are 4 barbed hose connectors on the right shoulder of the jumpsuit. They are 2” long and held on with 1” tan webbing. The same type of connectors are also on the belt. Com Pad: There is a com pad in the thigh pocket. The window for the com pad is 2.5”x2.5”. It is silver, with 2 red buttons on the lower left side. There is a raised gear like circle on the upper right side that takes up most of the com pad. The belt is made of ribbed nylon webbing. It is tan or khaki in color, 2” wide, and has a silver roll-pin buckle. There are 5 hose connectors on each side of the buckle, held on with 1” nylon webbing of the same color as the belt. There is a loop of webbing on the right side of the belt, held closed with a silver-color snap, where the electro-shock prod may be carried. The boots are brown leather or leather like material, with flat black rubber soles. They come to mid calf and have top-stitching, but no visible closure. Necklace: A bronze metallic pendant is worn on a silver-color cord around the neck. There is a second shirt front inside the jumpsuit that is hidden by the scarf. It has a mandarin style collar and is made of the same material as the jumpsuit. Material is brown in a smooth material. Worn around neck inside the collar of the jumpsuit. Constructed in a loop with a seam at the back of the neck. Pulled back into a ponytail with a teal blue tie. Blue electrical wire is screen accurate. Square bangs with face framing on the sides flipped out. 1. Electro-shock prod: There is an electro-shock prod that is clipped to her belt. The body of the tool is black and orange on the base and top. There are silver 2 prongs on top, and one is taller than the other. There is a silver panel on the body with 2 buttons. There are thin red and black wires going from the top of the body to halfway up the taller prong.